New on Slovakian label Hevhetia, this Neo-Classical programme features the Quasars Ensemble, founded in 2008 by their conductor, Ivan Buffa. 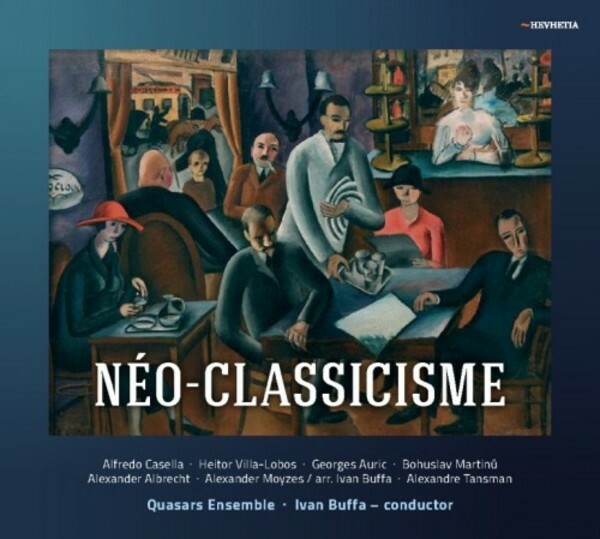 The pieces on their disc date from the years 1920-32 and group together the work of Martinu (La Revue de Cuisine), Georges Auric (Marlbrough s'en va-t-en guerre), Villa-Lobos (Choros No.7) and Alfredo Casella (Pupazzetti, op.27c). These composers will be on most listeners musical horizon. Lesser known, but sharing this Neo-Classical programme, are Alexander Albrecht with his Quintetto frammento, Alexander Moyzes (Divertimento, op.11) and the Septet by Alexandre Tansman. Most, if not all of these works, are not going to get frequent live performances. This beautifully played and recorded Hevhetia disc is a marvellous way of getting to know some equally marvellous music composed in a very distinctive style.